So this week is ‘Meat Free Week’ in the UK (and I believe, Australia). I must confess, it has taken me by surprise – I only found out about it yesterday (after having already bought food for the week… with meat in it!). What a bad food blogger, I should have my finger on the pulse(s). Sorry. If you want to find out more about the campaign the official website is here, but the general aims of this week seem to be to raise awareness of how much meat we as a nation eat (more than double the world average! ), and how this can impact on our health and the environment. Also thinking more about where our meat comes from, and whether it is ethical or sustainable, which is something I personally find important. If you are attempting Meat Free week this year, or just want some veggie ideas, then here are some of my favourite non-meat meals, and some I can’t wait to try! Take 1 head of broccoli, chop roughly and blanch in boiling salted water for approx 3-4 minutes. Lightly fry a garlic clove, and dry fry/toast approx 75g pine nuts. Drain the broccoli and add to a blender or food processor with 100ml olive oil, the toasted pine nuts, the garlic, 1 mild chilli and approx 50g of grated parmesan cheese. Blend to a paste to create the pesto. 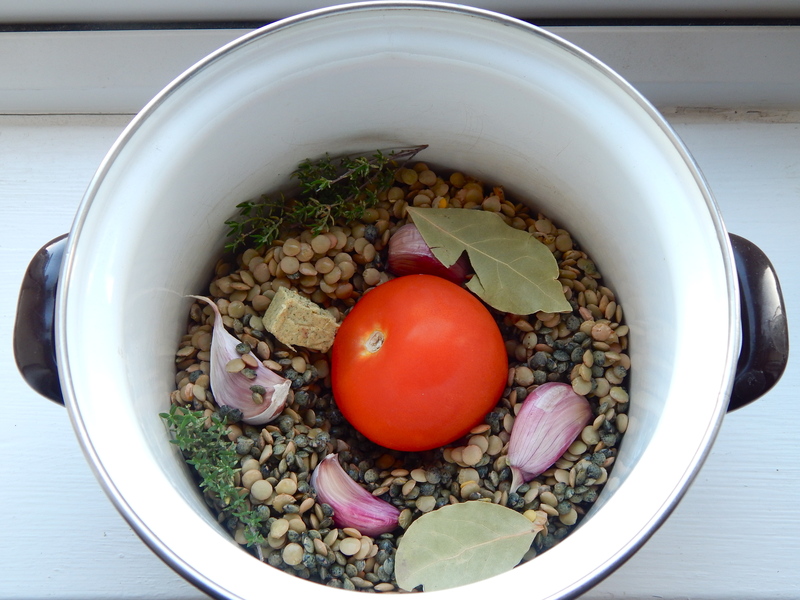 Season with salt and pepper to taste. Yum! These beauties are a delight, and quite spring-like. Broad beans, peas, new potatoes, feta, mint – just lovely. 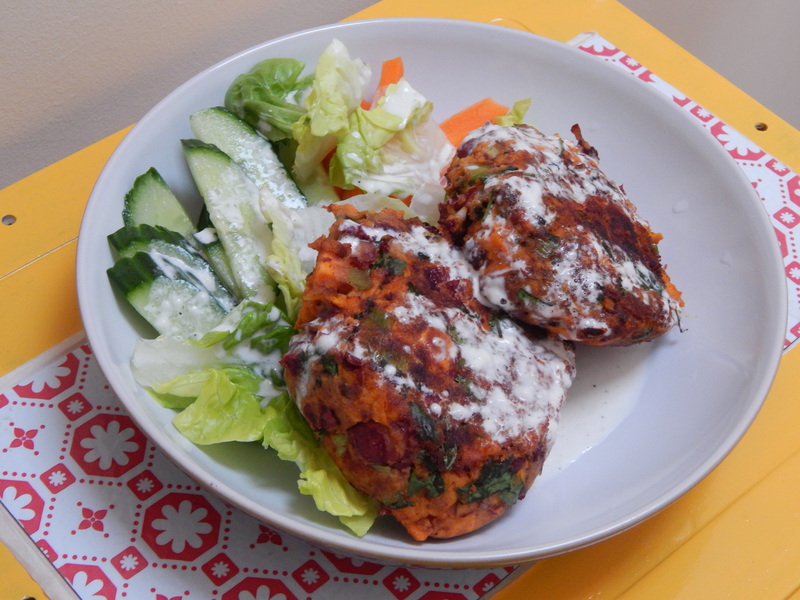 Another spring-like delight, these went down a storm at a veggie dinner party we gave a while ago. The sweet lemon dressing makes it special. Posh comfort food that is… anything with truffle in I will eat (I think), and a ragu with mushrooms sounds comforting and stodgy and lovely when there’s still a chill in the air – like today! 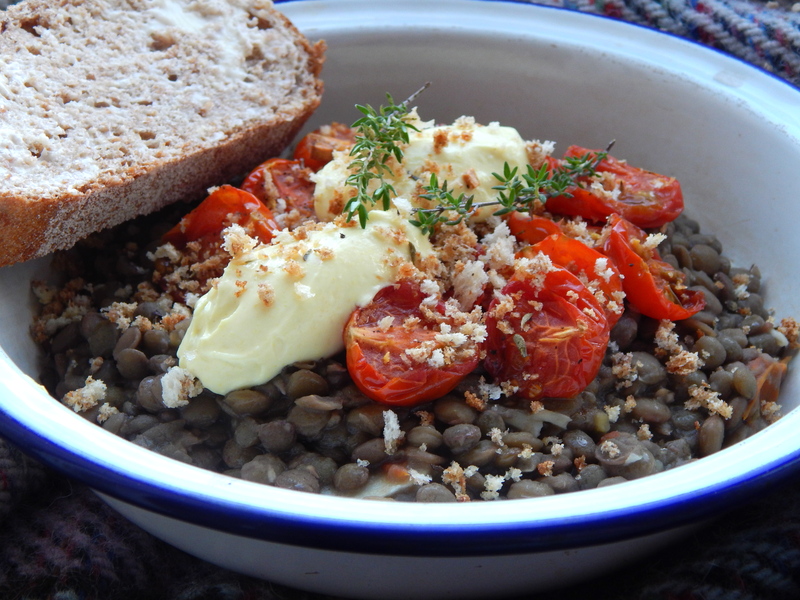 Chilly comfort food again – lentils, pulses and split-peas are some of my staples and they are elevated with the caramelised shallots and tender stem broccoli in this recipe. A lovely salad which is excellently very tasty cold as well as hot. 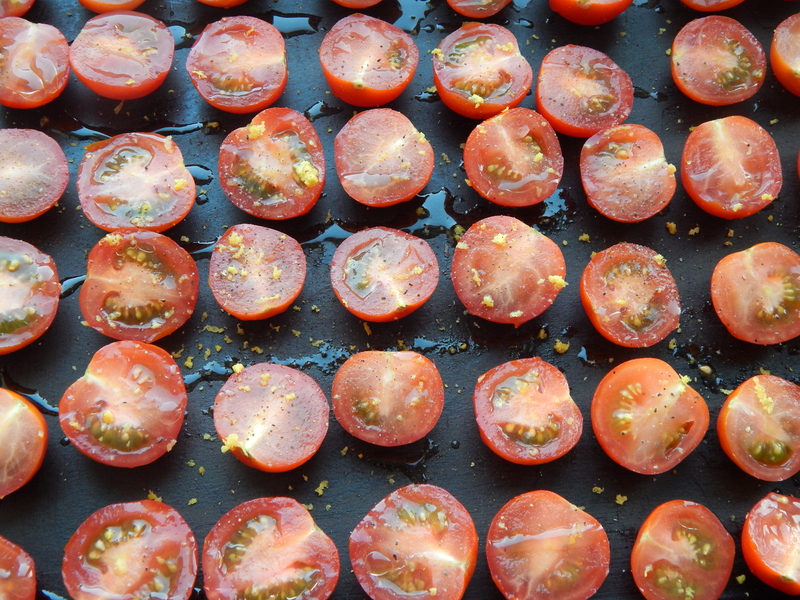 Make a big batch of this and it’ll last most of the week! We tend to put blue cheese in it instead of goats, but whatever you choose it’ll taste great. Very filling too. Three of my favourite words in one sentence there – sourdough, halloumi, and mushrooms. 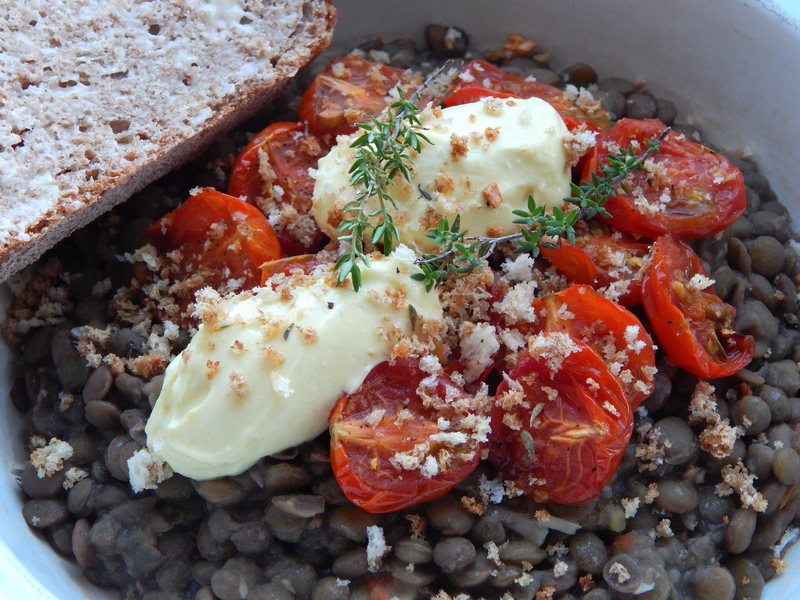 Could easily be supper instead of brunch if you (i.e I!) wanted. Had to get eggs in there for brunch! This sounds delicious, and I’m sure normal garlic would work just as well as black – or maybe even wild garlic? 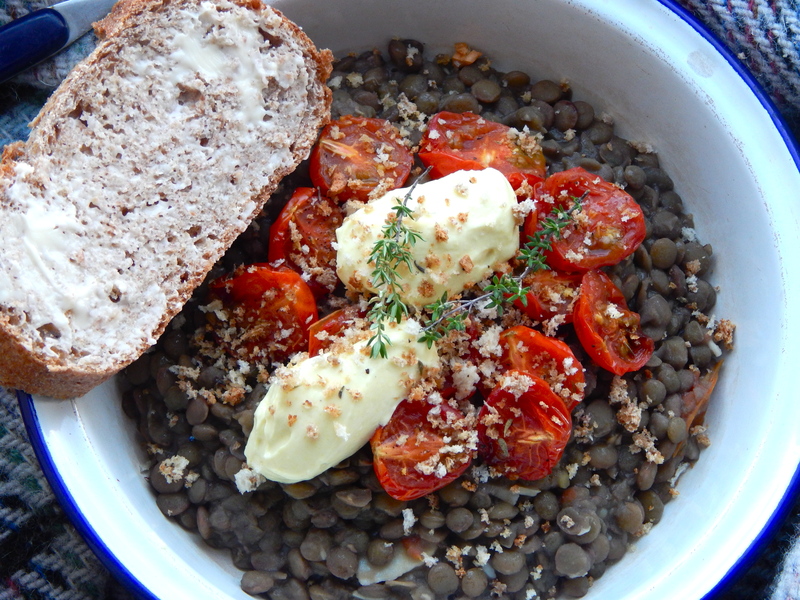 You might recall I did a post on an (almost) meat-free week a while back, and the recipes there are some of my favourites too, but I didn’t want to replicate. Therefore, the link is here if you’d like to take a look. Meat-free or not, have a tasty week! You might remember a couple of weeks ago I ate too much. This was a good week, but probably not very good for me. It involved a LOT of meat. To try and counteract that a bit, the OH and I ate (almost) vegetarian food for (almost) a week last week… (It was five days, and there was a tiny bit of belly pork involved). Anyway, we found some tasty recipes to cook, and i really didn’t miss meat much, so i thought i’d share them with you. Normally on a weekend we will indulge in an english breakfast or a variation on one at some point. 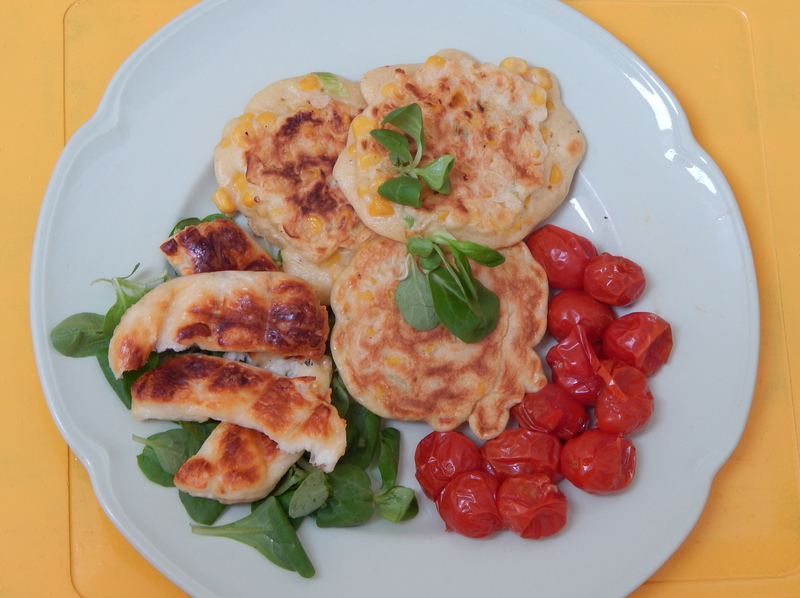 It’s normally grilled, and the eggs are often poached, so not the worst meal you could have – but having just watched a programme about how bad processed meat is for you, we didn’t feel much like indulging in sausages and bacon anyway! 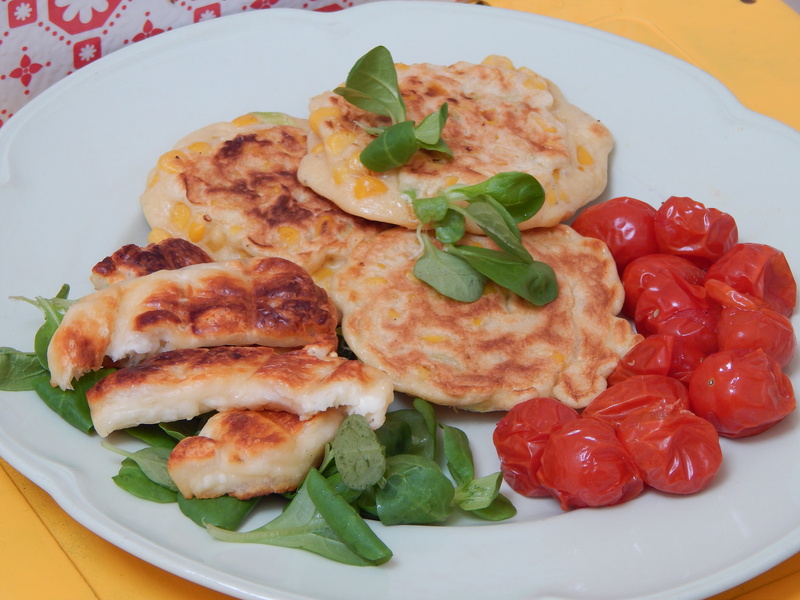 Instead we had sweetcorn and spring onion fritters, grilled halloumi, grilled cherry tomatoes, and lambs lettuce. It looks colourful and vibrant and it tasted yum. 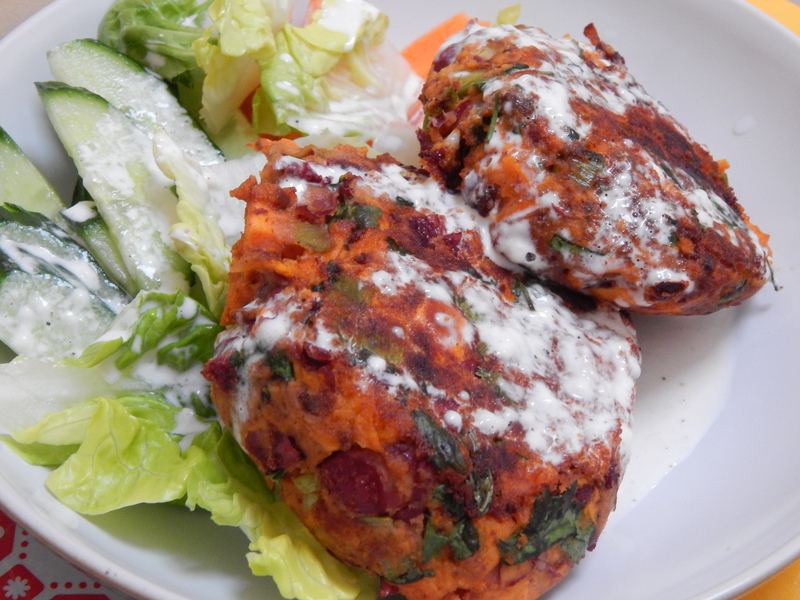 Fritters were adapted from Lavender and Lovage. 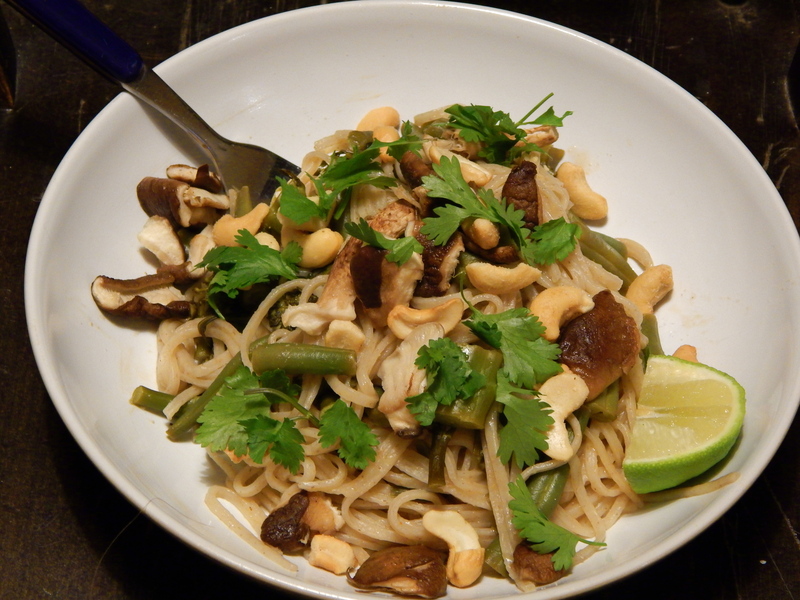 This is the recipe with the teeny bit of meat, but it’s really just to add depth of flavour. 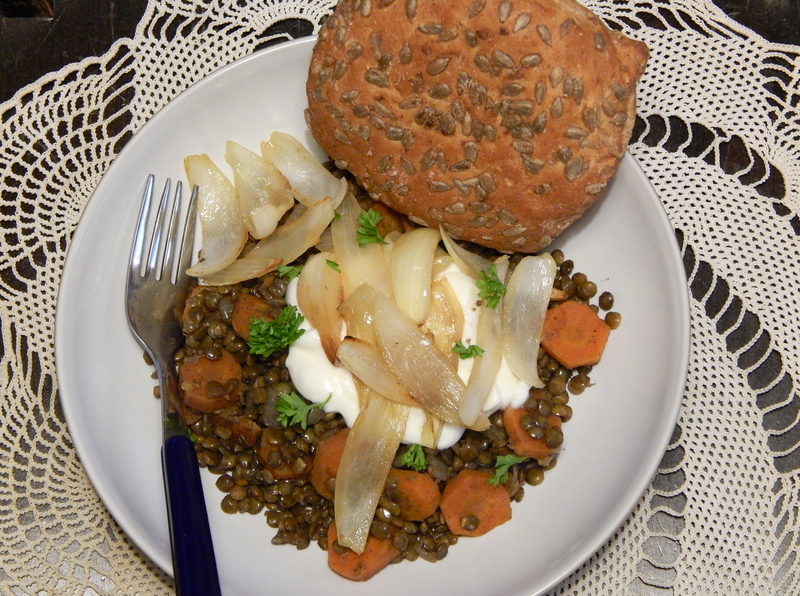 This isn’t the healthiest of recipes, as the onions are slowly cooked in butter, but considering the rest of the ingredients are lentils, carrot and some spices, it’s so delicious! 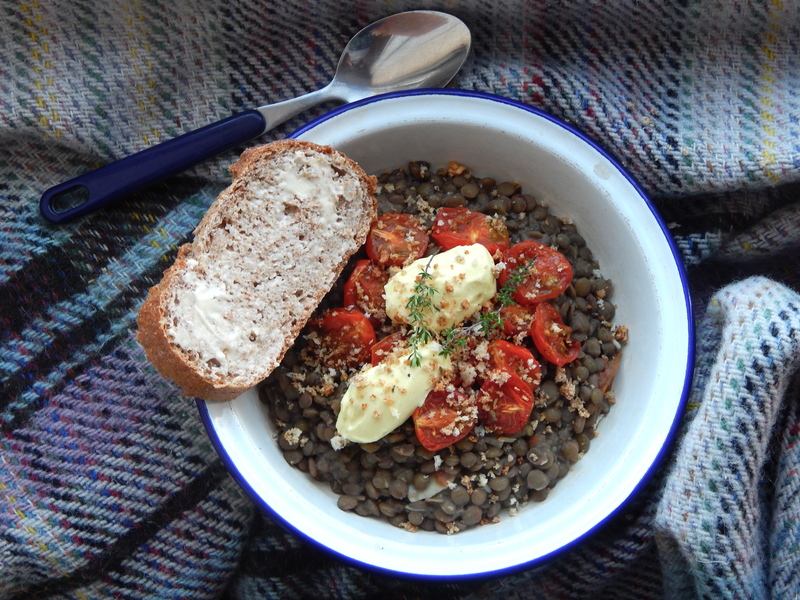 We had it with creme fraiche and a seeded roll, it’s a really good autumnal tasty stew, and you could easily forgo the meat if veggie. 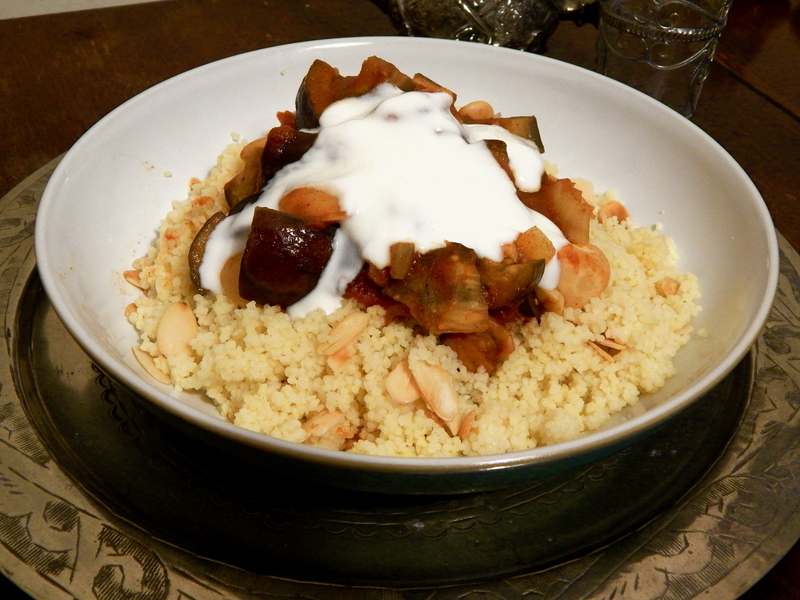 Another BBC Good Food recipe, aubergine is a great meaty vegetable, and this Tagine is only 361cals, but filling. 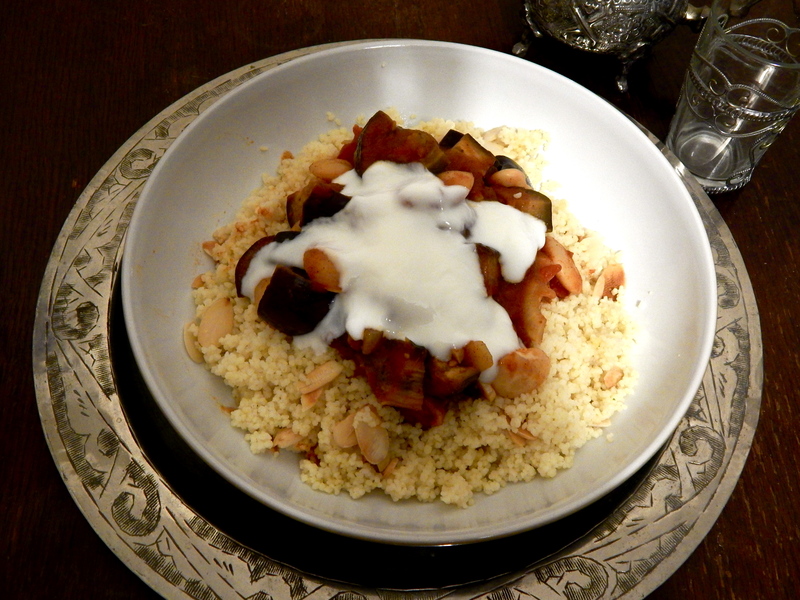 The Harissa makes it pretty spicy so we had some natural yoghurt with it too, and the almonds in the cous cous are a nice extra. 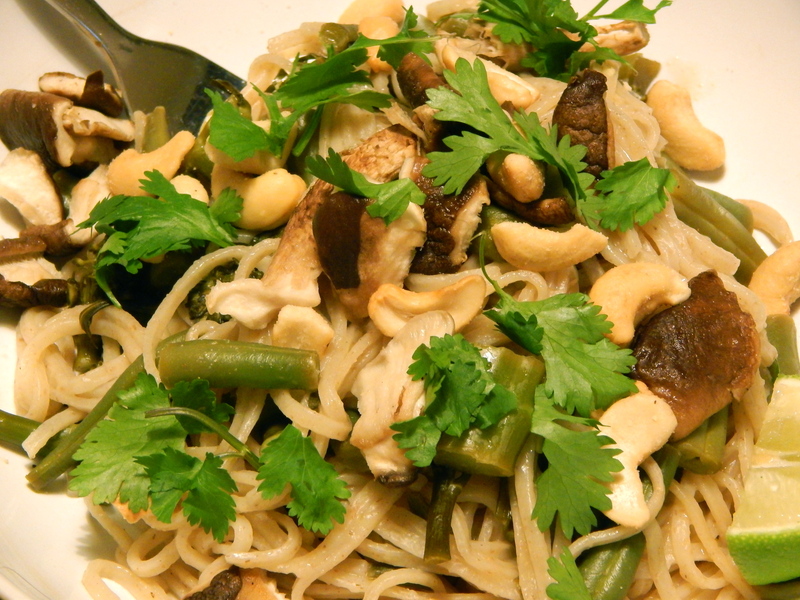 If anyone’s got any other tasty vegetarian dishes I should try let me know!